Apologies for not updating the blog sooner. It has been a case of classic conundrums: finally escaping for a bit of time off and so not wanting to get back at the computer right away; and finding a great boondocking spot where cellular Internet service is marginal. After two nights out in the windy wild desert of Anza-Borrego I’m starting to rejuvenate. But that’s later in the story. We left Tucson on Monday morning for the 370-mile trip across the west on I-8. Normally this is a trip that we’d take two days to complete, just because it’s more fun to stop along the way and camp for a night somewhere, but in this case we wanted to catch up with Kyle & Mary as soon as possible so that they could be reunited with the daughter we’d taken hostage. I have done the I-8 drive many times but so far I’m not tired of it. The desert scenery is interesting to me, although to other people it’s just a lot of nothing, and knowing something about the history, politics, and geology that have shaped this region makes me reflective, which makes the drive go quickly. The neat thing is that there’s still a lot to learn, about the ancient native communities, the volcanic eruptions, Patton’s tanks practicing during WWII, the stories of dusty little towns and abandoned airfields, the real estate plats that never happened, and the endless human drama of the border. Our goal was reached by about 5:45, safely before sunset, which was ideal because we were planning to find Kyle & Mary and Brian & Leigh at one of Anza-Borrego’s desert boondocking spots, near Clark Dry Lake. Being telecommuters, they all have a nose for spots that offer usable cell phone signal, and Brian & Leigh in particular are adept at finding those spots that offer the ideal balance of remoteness & technology. In this case they’d plotted exactly which empty patches of desert near the dry lake would have signal, and as we arrived they stood by the road to wave us in (there’s no sign to find this spot) and help us park in one of the few locations where we could get online and be near them. 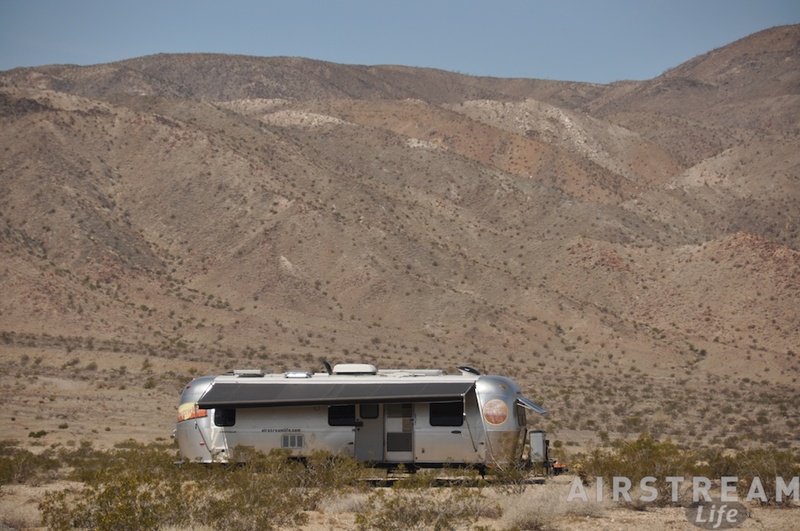 So here we are, three Airstreams parked on the valley floor between Coyote Peak and the Santa Rosa Mountains with the dry lake less than a mile down the shallow slope. A few other RVs of various make are scattered around too; this isn’t an unknown spot. Nearby is Pegleg, a popular boondocking spot a little closer to the town, and all along the 22 miles of the Borrego Salton Seaway road there are others scattered in the canyons and flats as well. There’s no place where it feels even slightly crowded. This is a desert park of vast dimensions, so we are enjoying a panoramic view where most other RVs (other than our friends) are mere dots on the horizon. It’s going to be hard to move to traditional campground after this. After the long drive we were inclined just to settle in rather than rushing out to go exploring. Our packing was somewhat rushed, so there were things to finalize inside the trailer, and we needed dinner, and of course we’d been in the car for seven hours so there was no desire to get in it again. I broke out the little Weber propane grill for sausages and Eleanor made some pasta and vegetables, and then as we were finishing dinner everyone came over to visit because we were all excited to be here. None of us are retired and we all have jobs (whether office-type or parenting/teaching), so Tuesday morning was really all about work. I had made some effort last week to clear my desk as much as possible, so I worked only about three hours in the morning, but when I was done everyone else was still at work, including the mothers and daughters doing homeschooling. Eleanor and I finally got a chance to head into Borrego Springs (while the girls were preoccupied between themselves) in the afternoon, to check out what’s changed in the two years since we’ve been here. Not much, it turned out, which is fine with me. I like the small town nature of the place, the lack of retail chains and cutesy gift shops, the farm stands and the complete absence of crowds. While Eleanor hung back to work on dinner and the girls talked books in the 34-footer, the rest of us loaded up in the Mercedes to do a little 4WD road nearby, called Rockhouse Canyon Road. It passes through Clark Dry Lake and onward through soft sand and gravel, eventually ending up at a place called Hidden Spring several miles up. This turned out to be a moderately interesting drive, but the road turned a little too technical toward the last mile and upon a vote of the car passengers we turned back. There aren’t a lot of desert blooms this year, owing to a dry winter, but we found a few. The lake does occasionally get wet, and when it does there is a tiny species of brine shrimp that flourish in the shallow muddy water. Bert Gildart photographed these on his blog last winter, using some advanced photographic techniques. When the lake is wet the road is impassable, but for our trip it was dry, cracked, and very solid. Since we arrived it has been lightly breezy, but last night the wind picked up and began to howl in the windows we’d cracked open for a little air. Everyone took in their awnings and I found that the Weber would not stay lit at anything less than full heat, which meant our chicken had to be finished in the oven and dinner was late. All night the wind raced past the Airstream, which wasn’t discomforting but a little noisy. This morning it is still howling at a solid 20-30 MPH (my estimate) although the official prognostication is for much less. The weather service guys clearly aren’t boondocked out here with us in a vast open stretch of desert. Today we have a reservation at the state park campground, so we’ll be hitching up and moving a few miles. This gives us two nights of full hookups before we head out again on Friday. After that our destination is unknown but I think since it will be Good Friday and Easter weekend we will likely be boondocking somewhere for another couple of nights. We’ll coordinate with our friends and may stick with them, or may head off on our own. Except for the wind, it sounds like fun! Wish El a happy birthday for us! Have a great time!